Giving Children Hope welcomes Joe Schoeningh as acting CEO. Joe brings over 35 years of experience in the non-profit field, including many years as Executive Director at Second Harvest Food Bank in Irvine. Under his leadership Second Harvest outgrew its 52,000 sq. ft. bldg. and after an $8.5 million dollar capital campaign renovated a 126,000 sq. ft. facility at the former El Toro Marine Base. As GCH continues to expand its mission “across the street and around the world”, Joe will oversee the continued business excellence of GCH, allowing COO Sean Lawrence to spend more time developing staff, programs and visiting field projects. Since Joe’s retirement from Second Harvest in 2013 he has served as a coach for Executive Coaches of Orange County as well as a County Government liaison for Second Harvest. A native of Northern California he along with his wife and 2 children moved to Southern California in 1973. He had a successful career in the Office Products industry for some 30 years. He and his wife reside in Costa Mesa, California. 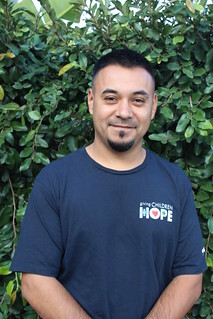 Sean joined Giving Children Hope in 2010 and serves as the Chief Operating Officer. He quite possibly has one of the most hectic schedules at Giving Children Hope, to say the least. He is either meeting with board members, educating potential donors on our mission, brainstorming with staff members, traveling abroad for the organization or attending events on behalf of Giving Children Hope. Sean grew up as a missionary kid in Southeast Asia and later worked with his church in Southern California to develop a missions program that extended to Japan and Rwanda. In addition, Sean spent several years reporting on missions work and humanitarian crises around the world for a mission’s magazine. Sean’s light-hearted and funny personality definitely makes working at Giving Children Hope enjoyable for the staff and volunteers. Mikaela assists with Giving Children Hope’s global operation partners in order to distribute much-needed relief supplies to people around the world. These supplies are distributed internationally as a result of natural disasters, famine, social upheaval or it may simply be because it is a heavily poverty-stricken area. Mikaela also assists Giving Children Hope in the daily operations of the organization. Christine oversees Giving Children Hope’s domestic programs like We've Got Your Back and Giving for Living. She spends a great deal of time and energy connecting resources at Giving Children Hope with partners in our local communities. Christine comes to work everyday with drive and motivation that she passes onto our partners at Giving Children Hope. Christine is a busy hockey mom who graduated from Mount Saint Mary's University. As the Administrative Coordinator of our backpack program, Eli's job requires her to wear many hats all at once! She acts as the liaison between the schools and families that are involved with Giving Children Hope. This requires her to identify families who could benefit from the resources that Giving Children Hope offers. If the family needs a resource that our organization does not offer, Eli always finds another organization or program that does! Eli also oversees the Christmas Wish List program ensuring every homeless child on our program and their siblings receive a magical Christmas. Her daily duties require her to deal with a lot of paperwork, social work and therapist-like responsibilities that she gladly carries out. Rosa runs the Giving for Living donation center and makes sure that the program has everything it needs to continue providing services to those who can benefit the most ! She also oversees all of the handling fees and logistics to make sure everything stays afloat. Rosa feels blessed to have a job that enables her to help families in need. In her free time, Rosa enjoys going on walks and spending quality time with her children. Barbara runs the accounting side of Giving Children Hope. Barb first learned of Giving Children Hope through her church youth group and would volunteer her time with the We've Got Your Back program to pack backpacks. She wanted to give back to the community and felt that someone in need could benefit from any bit of help that she was able to offer. Barb came to California from Omaha, Nebraska and knows that this is where God has meant for her to live. Marius is the Warehouse Manager who has the hectic task of ensuring that all of our international and local donations are properly received and distributed. When he isn’t on the forklift loading containers, he is busy tending to warehouse inventory and medical supplies. Marius came to the United States from Romania bringing with him an understanding of what it's like to grow up in an impoverished country. Today he is glad to have the ability to help those who are without resources. Marius enjoys spending time with his beautiful wife, son, and baby girl… and don’t forget to ask him to pick up a coin with the forklift, you’ll be amazed! Angie oversees all the Giving Children Hope volunteers on a daily basis. You’ll often find her in the warehouse explaining to volunteers the process of filling backpacks and sorting food. Our volunteers come from various companies, organizations or individuals who simply enjoy helping those in need. A large amount of responsibility sits on Angie's shoulders; roughly 1,300 children and their families depend on the food-filled backpacks each week! Angie has a contagious sense of humor and is a busy soccer mom outside of work. Kim is an amazing addition to our team and helps sort relief supplies, loads containers, and leads volunteer groups. She is a mom of 2 wonderful boys and loves dancing with them. For fun, Kim is an expert at karaoke, but won't reveal her go-to karaoke song. She wants to suprise us all! She loves working at Giving Children Hope because she enjoys that everyone is working together towards a mission to do good. With the help of volunteers, Nicole masterfully sorts through thousands of medical supplies to prepare them for international shipment. Nicole loves witnessing the impact on the lives of the children we serve at Giving Children Hope. She has enjoyed volunteering to help those in need since a child but it’s a special experience to now get to do it for her job. Nicole loves her two kiddos and is looking forward to her soccer-mom filled weekends when the season starts! Raymond is our driver and he delivers our backpacks every day to schools throughout Orange and Los Angeles counties, and he always does it with a smile! When he's not at work, Raymond is a dad to four girls and a husband to his wife of 15 years! Everything he does revolves around his family and he loves spending time with them outdoors, whether that is camping or going to the park. We love having Raymond a part of our team!